The third Golden Gauntlet has come and pass! 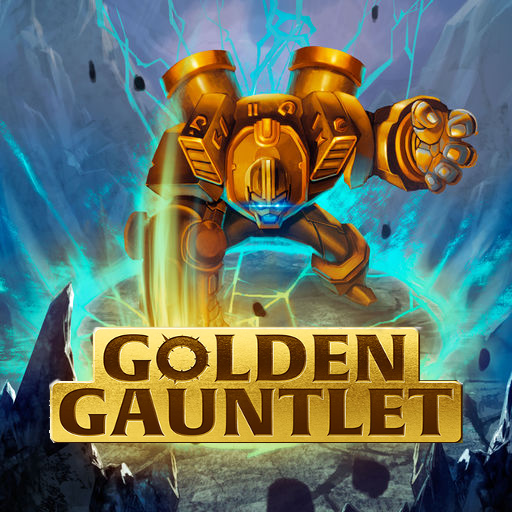 I managed to win the entire thing, therefore, I'm here today to provide a primer on the deck that I played through the Golden Gauntlet. As with any deck primer actually worth its salt, we'll begin with what the deck aims to do: Build a monster. But beyond that, we also deny our opponents avenues to answer our threat through cards that punish 'cheating' in cards through free cards or bringing creatures into play not from hand. That is not to say that we are inflexible in our game plan, however. We can just as easily switch gears and build up a board, attempting to out-value our opponent to victory. So, without further ado, allow me to go through the cards and their roles in-depth. Aeronaut is certainly already a familiar face in Solforge's constructed scene, being a very solid inclusion in many an A/T Rage or A/U Bots deck. However, the other facet of this card that is often overlooked is how well it carries pump. With a high health value, mobility, and armour, its body is not only well positioned to get pumped, but it can also choose its fights thanks to its mobility, allowing you to 'cash in' on the armour that you'll be amassing on this champ right here. In general, this is probably the best candidate whenever you build a monster with this deck. Aeronaut is also your main tool of pushing damage, so also try to keep it near the centre so you can get as much damage through if you start dominating the board (particularly important against slower decks like Stasis Warden). While Aeronaut may be the more flexible and better threat, this tin can isn't to be outshone. Armour has always been the most dangerous keyword to stack, and this guy has it in spades. While he does break if his shell is pierced, it is still not at all a bad idea to toss your Gauntlets and Pummel Packs onto it, since most decks can't muster up upwards of 9/11 damage in our turn, and if they do so, they often spend two cards to do so, leaving you with a 2 for 2 (or in the case of Gauntlets, a 3 for 2), which isn't all too shabby, considering that passes initiative back to you. It should be noted that while it has a extremely powerful level one, it doesn't scale too well, although 12 armour is still a good fulcrum to cast Gauntlets off. Hence, if this is the monster you built, you probably want to end the game pretty quickly. This little bugger over here. A Duskmaw Tendrils combo is sure to ruin any monster's day, and Arbiter makes your opponent think twice about doing just that, as it now takes up their entire turn, and making a big Arbiter further compounds that conundrum. But with all that said and done, almost any creature can become a monster with several spells tacked onto it, from Oreian Justicar to Relic Hunter, your monsters can be as opportunistic as they come. Gauntlets have always had a soft spot in my heart, which makes its snug fit into this deck a total win-win. For its first two levels, Gauntlets functions as both a removal and buff spell, as with what I mentioned about armour earlier, it's a lot more dangerous stacked, and Gauntlets exemplifies that. Meaning that if you can get if off a Forgewatch Sentry or scouted Aeronaut, you're in business, but not so much otherwise. Sulgrim himself is also a total boss, making whatever you have for a board sticky, has a resilient body himself AND nukes something every turn you untap with him for a minimum of 6 damage. Sulgrim is one of those creatures that takes an even board and wins it, stabilises a losing board and adds insult to injury to a winning board. Levelling Gauntlets is at its best against decks that rely on damage to remove your creatures, a la Oratek Explosives and Rage of Kadras in AT Rage. There may come a time where your opponent attempts to ignore your monster and try to grow a board around it. Well, Scythe is there to tear down that plan, giving a huge attack boost to your designated monster while swinging trades left and right on a crowded board. However, at its worst it's a bad Hungering Strike or completely dead card. Regardless, this is sometimes the best card for pushing damage through and making your threats impossible to ignore. 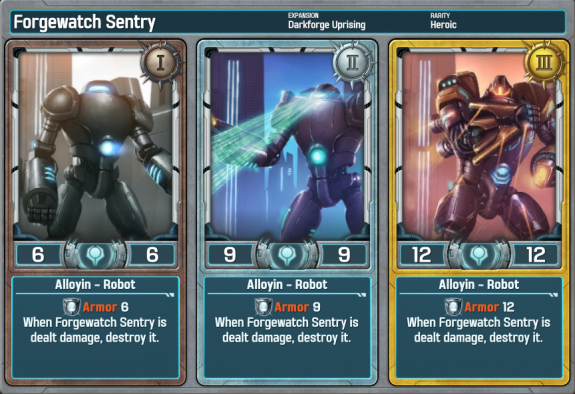 Reducing opposing creatures' attack also can save a Forgewatch Sentry from breaking, so keep an eye out for that. And our 'surprise' inclusion is... Pummel Pack! There isn't much to say about it really, it makes an immortal monster every so often, and is sometimes a glorified Tech Upgrade. Figured the little guy deserved a shout-out, everything gets better with Relic Scout, but your monsters get even better with a Scout under them. Be wary of Leyline Demons, however. Consider skipping them until player level two (a 4/6 matters a lot less in PL2) if you suspect your opponent has Leyline Demons. You may have noticed that almost all of our pump is situational. Which might strike you as odd since the main plan of the deck is supposedly to build a monster. The plan is to build a monster, but a monster of opportunity. See your opponent is on A/T and can't deal with that Forgewatch Sentry? Pummel Pack it. That's the gist of that plan. In the event where building a giant threat isn't wise, you can still take a big board approach, using Aegis Knights effectively and falling back on Leylines to win the board and eventually, the game. There are several cards that warranted the 'coming into play not from hand' (There needs to be a better way to say this) hate. First and foremost, Bron, Wild Tamer (and by extension, the Dinosaur deck) was something I expected to be the default deck of choice, which while didn't quite end up happen, did not make this duo useless at all. Frostmane Eggs, Immortal Echoes, Marty activations, Leylines, creatures that dont come from hand are everywhere. You could always cut down on the Sentries if they under-perform (the playability of Leylines is meta dependant, after all) though. Free is the more relevant hate of the two kinds we run in our deck, with Relic Scout, Duskmaw Tendrils running amok in constructed. It also had some fortunate collateral in butchering Stasis decks in the top four and beyond. Arbiter makes a second appearance as a hate card, usually being support to prevent your threats from being answered efficiently (usually through denying Relic Scouts and Duskmaw combos), and also completely shuts down Lucid decks of any kind, like the previously mentioned Stasis deck. And that concludes the primer portion of this article! The rest will be a sort of easter egg section that describes the thought process of the development of the deck. In the very first version, there were three Cacklebones in the list, they sucked even with Arbiter and Demon though, and were cut. That's the reason why the version I locked incorrectly had 3 Arbiters. The original concept was not build a monster, but actually 6 Leylines, and later on a lot of Fun Police. The actual shell was the last thing I came up with. Link suggested Pummel Pack the morning of the tournament (remember, we live on the right side of the world), which struck me with how Arbiter, Pummel Pack and Duskmaw interacted. Thanks Lonk! Xerxes used to be a major part of the first few iterations of the deck, although he just simply didn't make it because there weren't enough cards that abused its stealing mechanic. And that's all from me this time! I hope you find as much success as I did in the queues, and have a wonderful day. awesome job, eon. you deserve some tasty cake. Yes, tasty cake filled with the souls of the innocent! I think the short way to say "comes into play not from you hand" hate is "reanimator/token" hate. It covers most if not all of the ways to play something not from your hand. I like using the term, (N)ot (F)rom (H)and.